Jang Dong Gun is a Korean topstar! How did I learn about Jang Dong Gun? I still remember about six years ago, I always tuned in to the cable channel Star Movies Mandarin. It’s the cable channel that shows mostly Hongkong movies, and sometimes Japanese and Korean. During that time, I’d tune in to the channel after everybody in the house has gone to bed and stay up until 5 or 6 in the morning. I have always been a night owl since I grew up in Angeles City :D.
One Saturday evening in late 2000, while I was channel surfing I saw a gorgeous guy in a movie on Arirang TV. I stayed and watched since I was mesmerized by the gorgeous leads in the film. It had English subtitles so I was able to understand. The movie had the same plot as Meg Ryan’s “Addicted to Love” but a little subtle. I stayed up until the end waiting for the end credits but it was in Korean. Unfortunately, I wasn’t able to get the names of the lead. Looks good in a floral shirt! The following Monday, I went to work and the first thing I did was to find the website of Arirang TV. They used to have a bulletin board and so I took the chance to ask who the guy was in the movie that was shown Saturday night. I got an immediate reply and found out that the guy is one of the most popular matinee idols in Korea and his name is Dong Gun Jang. I didn’t know then that Korean names are written with the last name first. I googled Mr. Jang’s name and was able to find a few information about him. I told my friends about the guy and they didn’t really pay attention to me since they were not really interested in non-Hollywood actors. I even told them that he looked a bit like Wendell Ramos just to get their attention but to no avail. Now, they are so addicted to everything Korean and its my turn to laugh at them. 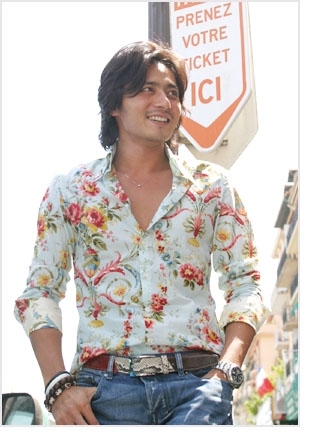 Anyway, I held on and tried to find more 411 on Jang Dong Gun until I found one of the English websites made for him. So on July 18, 2001 I posted a message on his bulletin board and became a regular visitor of the site. I spent hundreds of hours downloading every JDG picture, video, sound clips and anything related to him that I can find on the net. I even bought a CD writer so I can transfer them to CD-ROM’s and keep them forever :D. I still have some of the files on one of my hard disks. Until now, I’m still a fan and I still collect JDG stuff. I probably wouldn’t be here in Korea if not for him, since he made me interested in everything Korean. Late last 2003, I would have had the chance to see him in person in an autograph signing session for Posco. Unfortunately, I saw the notice on the morning of the day of the event. My husband was in his office at that time and I had nobody to tell me where the event was going to be held. I really regret that day but anyway, we live in the same country. I’m sure that there will be more chances in the future. My husband is luckier, though. He was able to see Jang Dong Gun near Seoul Cinema sometime in 2002 during a preview of “2009 Lost Memories”. Waaahhh! JDG…certainly one of the best actors in Korea. JDG is one of my korean boyfriends! hehehe, di ba sabi ko sa iyo–sa akin sya?! i have always liked him, even had the chance to see him up close and personal…well, a glimpse was more like it, kasi naman naka sunglasses na nga eh, naka cap pa! di bale one of these days, we will have that autograph + picture with him! hi betchay, just dropping by! omg, like ko din si JDG! i can’t wait for his new movie to come out! isama mo naman ako if he has autograph signings or premieres! cheers! i also like him too… i first saw him in the mini series all about eve!!! he looks very young even he is already 33 years old!!! hi eers el mejor actor de korea jan te quiero muxo suerte sigue adelante no te olvides que tienes una admiradora en perÃº te quero y pronto ire a korea . Hi, I’m a new fan of JDG and am planning to start my own blog. Isn’t he just gorgeous? And he’s just the perfect gentleman. Can’t wait for screening of Chen Kai Ge’s The Promise where he will be playing the lead. Which is his bulletin board? hi sandy! watch out for Time Magazine… he’s gonna be on the cover soon! hi there!!! I also love Jang Dong Gun. I’ve seen him in his soap opera “All About Eve” and I would say that he is really handsome. I also was able to watch his movie, “TAEGUKGI” and I would say that he acts really well. when will Jang Dong Gun come to Indonesia ? Oh no, no, no. I am so jealous but this was last year so maybe it’s not true anymore. Maybe it was just a fling? Please find out, Betchay for us, JDG fans. You are there and I am so far away here in California. I’ve seen him up close, so cute, gogeous, hunky-dory handsome. But he needs a woman by his side to be happy. send me a letter in 4-h losmartirez st.san jose navotas city! Hi Betchay! Guess what, I went to Jang Dong Gun’s birthday party in Yokohama. He’s a lot good looking in person and still looks like a twenty year old matinee idol. He was so gentle mannered and kept on bowing to us. He loves his fans that he celebrates his birthday every year with them. It was a dream come true for me. Hi Gidget! I’m so envious. A lot of fans are complaining why he didn’t have one in Korea. It must be very exciting to see him in person. Hmm, I’m contemplating to attend his next one. Hopefully, I won’t be busy. Buenas ! seria mucha molestia brindar un poco mas de info sobre este tema ??? esta muy bueno el blog, un saludo !